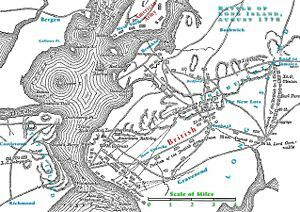 The Battle of Long Island, also known as the Battle of Brooklyn, fought on August 27, 1776, was the first major battle in the American Revolutionary War following the Declaration of Independence, the largest battle of the entire conflict, and the first battle in which an army of the United States ever engaged. The battle and its immediate aftermath were marked by the British capture of New York City (which it held for the entire war), the execution of the American Nathan Hale, and the burning of nearly a quarter of the city's buildings. In the following weeks British forces occupied Long Island. However, although he was encircled on three sides and outmaneuvered on Brooklyn Heights, George Washington managed to escape with nearly the entire Continental Army across the East River, aided by a fog which sprang up unexpectedly and lasted until the army was safely away from the British. This miraculous escape was taken by many American revolutionaries as a sign of God's favor. On March 17, 1776, the British fleet retreated to Nova Scotia following the end of the year long siege of Boston. Washington, who had successfully taken Boston, expected a new attack on New York City. He moved his troops to Long Island and New York City. On July 4, 1776, the Declaration of Independence was ratified in Philadelphia, Pennsylvania. In the same month, the British established their headquarters for their operation on Staten Island in Nieuwe Dorp at the Rose and Crown tavern, near the junction of present Nieuwe Dorp Lane and Amboy Road. On August 22, 1776, Colonel Edward Hand sent word to Lieutenant General George Washington that the British were preparing to cross The (Verrazano) Narrows to Brooklyn from Staten Island. Under the overall command of Lieutenant General Sir William Howe, and the operational command of Major Generals Charles Cornwallis and Sir Henry Clinton, the British force numbered 4,000. The British commenced their landing in Gravesend Bay, where, after having strengthened his forces for over seven weeks on Staten Island, Admiral Richard Howe moved 88 frigates. The British landed a total of 34,000 men south of Brooklyn. About half of Washington's army, led by Major General Israel Putnam, was deployed to defend the Flatbush area of Long Island while the rest held Manhattan. In a night march suggested and led by Clinton, the British forces used the lightly defended Jamaica pass to turn Putnam's left flank. The following morning, American troops were counterattacked and fell back. Major Prescott's command of about 2,000 men resisted the attacks, sustaining ninety percent casualties. The following morning, Howe and Clinton forced the Americans to withdraw, with heavy losses, to fortifications on Brooklyn Heights. During the night of August 30, 1776, the Americans evacuated Long Island for Manhattan. This evacuation of more than 9,000 troops required stealth and luck and the skill of Colonel John Glover and his 14th Regiment Marblehead Mariners. It was not completed by sunrise as scheduled, and had a heavy fog not beset Long Island in the morning, the army may have been trapped between the British and the East River. However, it took the British by complete surprise. Even having lost the battle, Washington's retreat earned him praise from both the Americans and the British. On September 11, 1776, the British received a delegation of Americans consisting Benjamin Franklin, Edward Rutledge, and John Adams at the Conference House on the southwestern tip of Staten Island (known today as Tottenville) on the former estate of loyalist Christopher Billop. The Americans refused the peace offer from the British in exchange for the withdrawal of the Declaration of Independence. The terms were formally rejected on September 15. On September 15, after heavily bombarding green militia, the British crossed to Manhattan, landing at Kip's Bay, and routed the Americans. The following day, the two armies fought the Battle of Harlem Heights, resulting in an American victory. After a further battle at White Plains, Washington retreated to New Jersey. The British occupied New York until 1783, when they evacuated the city as agreed in the Treaty of Paris. On September 21, a fire broke out on Whitehall Street in downtown New York City. High winds carried it to nearly a quarter of the city's buildings, consuming between 300 and 600 buildings (called the Great Fire of New York). 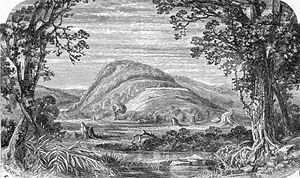 The British accused the rebels of setting the fire, although native New Yorkers instead blamed the British. In the wake of the fire, Nathan Hale, a captain in the Connecticut Rangers, volunteered to enter New York in civilian clothes. Posing as a Dutch schoolteacher, Hale successfully gathered intelligence but was captured before he could return to the rebel lines. Hale was captured on September 21, 1776, and hanged the next day on the orders of Howe. According to legend, Hale uttered before being hanged, "I only regret that I have but one life to lose for my country." While most of the battle was concentrated in western Long Island, within about 10 miles of Manhattan, British troops were also deployed to the east to capture the entire 110 mile length of Long Island to Montauk. The British met little or no opposition in this operation. Henry B. Livingston was dispatched with 200 Continental troops to draw a line at what is now Shinnecock Canal at Hampton Bays to prevent the port of Sag Harbor from falling. Livingston, faced with not having enough manpower, abandoned Long Island to the British in September. Residents of eastern Long Island were told to take a loyalty oath to the British government. In Sag Harbor, families met on September 14, 1776, to discuss the matter at the Sag Harbor Meeting House; 14 of the 35 families decided to evacuate to Connecticut. The British planned to use Long Island as a staging ground for a new invasion of New England. They attempted to regulate ships going into Long Island Sound and blockaded Connecticut. The exact number of American soldiers who fought in the battle is unknown, but estimates are that there were at least 10,000, mostly New York militia reinforced from Connecticut, Delaware, and Maryland. Perhaps 1,407 Americans were wounded, captured, or missing, while 312 were killed. A British report claimed the capture of 89 American officers, including Colonel Samuel Miles, and 1,097 others. Out of 32,000 British and Germans (including 9,000 Hessians) on Long Island, they sustained a total loss of 377. Five British officers and 58 men were killed, while 13 officers and 275 men were wounded or went missing. Of the Hessian forces under Carl von Donop, two were killed, and three officers and 23 men were wounded. The Minerva Statue: The battle is commemorated with a statue of Minerva near the top of Battle Hill, the highest point of Brooklyn, in Green-wood Cemetery. The statue on the northwest corner of the cemetery looks toward the Statue of Liberty. In 2006, the statue was evoked in a successful defense to prevent a building from blocking the Manhattan view from the cemetery. Fort Washington: Bennett Park in Washington Heights contains the ruins of Fort Washington, the last fort defended by Washington. A sign in the park commemorates it as the highest natural point in Manhattan. Van Cortlandt House: The Van Cortlandt House Museum in Van Cortlandt Park in the Bronx was where Washington made his last New York headquarters in 1776, before retreating to Fort Lee, New Jersey. Washington stayed there when he returned to Manhattan following the Treaty of Paris in 1783. Nathan Hale Hanging Sites: Memorials to Nathan Hale are scattered throughout the region since the site of execution is uncertain. A plaque erected by the Daughters of the American Revolution hung on the Yale Club at 44th Street and Vanderbilt Avenue by Grand Central Terminal says the event occurred there. Another plaque by the New York Historical Society says the event occurred at the northwest corner of 66th Street and Third Avenue. A statue honoring Hale is in the park adjoining the New York City Hall (which also claims to be the hanging site). The Old Stone House: A re-constructed farmhouse (c.1699) serves as a museum of the Battle of Long Island. It is located in JJ Byrne Park, at 3rd Street and 5th Avenue, Brooklyn, situated within the boundaries of the original battle, and features models and maps. 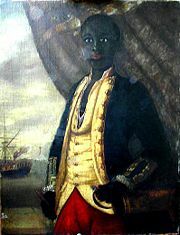 A picture of a black U.S. officer who was thought to have been participating, now revealed as inaccurate. Gallagher, John. The Battle of Brooklyn 1776. Castle Press, 1995. ISBN 0-7858-1663-1. All links retrieved May 18, 2016. "The Battle of Long Island" Thrilling Incidents In American History. "Americans Held Back Hessians Until British Attached From The Rear" Battle Pass. The Old Stone House, The Old Stone House and New York City Parks and Recreation. History of "Battle of Long Island"
This page was last modified on 18 May 2016, at 15:44.